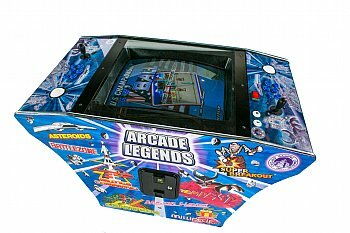 Arcade Legends 3 is not your standard classic arcade games rental. Our version contains over 240 classic arcade games. For a complete list, please click on the tab below that lists all the classic arcade games titles. 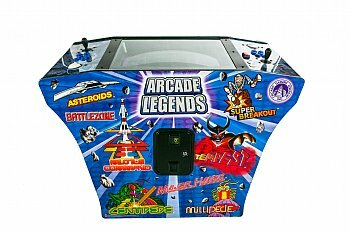 There are several of the most well known and popular classic arcade games on the Arcade Legends 3 rental including Asteriods, Centipede game, Defender arcade game, Millipede game, Missile Command and Space Invaders. Fans of Golden Tee arcade games rental and the many courses will be pleased as the Arcade Legends 3 offers numerous Golden Tee options. Measuring at 46 inches long by 24 inches and 34 inches high, this classic arcade games rental is slightly larger than the more traditional arcade game rental cocktail table. 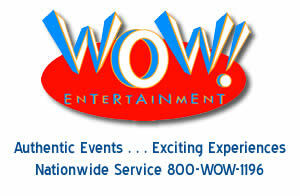 The depth and higher height make it stand out more for those considering it as a trade show booth game rental.